2 chicken schnitzel, regular or gluten free depending on your dietary requirements. Heat oil in a large frying pan over medium-high heat. Cook chicken for 4 to 5 minutes each side until golden and cooked through. Transfer to a plate lined with paper towel. Meanwhile, rinse and chop the lettuce, cherry tomatoes, cucumber and avocado. Discard the oil from the frying pan and place it back on medium-high heat. Place 2 slices of bread in the frying pan and cook until one side is golden, then flip to cook the other side. Remove from the pan and set aside. 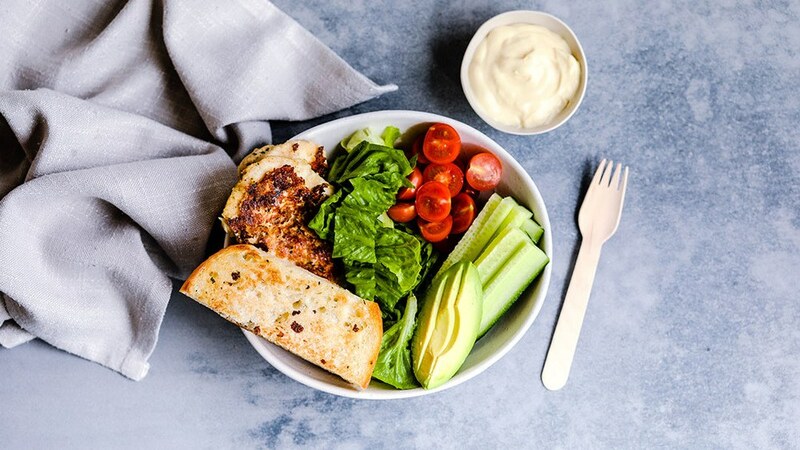 Cut the chicken schnitzels in half then divide the schnitzel, lettuce, tomatoes, cucumber avocado and pan-fried bread between 2 bowls. Finish with a dollop of mayonnaise.